Raith Rovers boss Ray McKinnon says he is “devastated” at the news that striker Lewis Vaughan faces a lengthy spell on the sidelines with a knee injury. The teenage striker opened the scoring with a penalty in Saturday’s 3-0 victory of League One opponents Albion Rovers in the Scottish League Cup, only to limp off on 29 minutes with a knee injury. A scan showed that the 19-year-old has suffered damage to the anterior cruciate ligament in his right knee, which manager McKinnon says will keep him out of the team for “months and months”. “I am absolutely devastated for him, I really mean that. McKinnon said that until the swelling in the knee goes down it’s too difficult to give an accurate estimation of how long it will take for Vaughan to recover. “He’s going to have an operation so at this time I’ve no idea how long he will be out for. These things can take forever. The manager said he had been looking for a midfielder to add to the squad but will now his turn his attention to getting in a new striker. “I’ll be looking around but this could also be an opportunity for one of the boys here to step up,” he said. Having declared himself “very pleased” with Saturday’s result the boss is now turning his attention to Saturday’s opening league match of the season when Livingston come to Stark’s Park, and another injury headache - this time in defence. He said: “Benedictus is suspended and Craig Barr and Lewis Toshney both injured. “We have three very good centre halves missing and that’s not ideal going into the first league game of the season. “But young David Bates has done well. “He’s only 18 and again this will be a step up to another level, but I’ve got a lot of confidence in the young lad and he’s backed himself up with performances. With two impressive victories over Cowdenbeath and Albion, McKinnon warns that Livingston will have better quality but is confident his side are ready. “That’s how it’s been going, building up for the start of the season, so we need to go out there and try and get a result on Saturday. “We’ve got a good bunch and if they go out there and do the business then I’ve every confidence we’ll get a result,” he added. Raith Rovers’ reward for Saturday’s 3-0 League Cup win over Albion Rovers is a home tie versus Hamilton Academical at Stark’s Park. Goals from Lewis Vaughan, Kyle Benedictus and Rory McKeown saw Rovers safely through to round two. 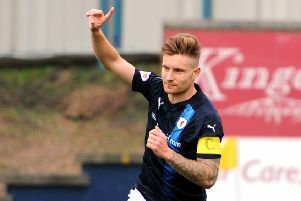 The Premiership side, who will visit Kirkcaldy on August 25, were one of the seeded sides in the hat for the draw at Hampden, which was made by Rangers legend Derek Johnstone and former St Mirren manager Gary Teale.